Mister Rushmore's face is not among the sculptures. Mount Everest was identified as the highest point on our planet’s surface in 1852. Of course, it wasn’t called Mount Everest then; it has probably occurred to you that the name doesn’t sound particularly Asian. For centuries, the locals had called it Chomolungma, which in Tibetan means something like “Goddess Mother of the World”. The team of British scientists who were surveying the area in the 19th century somehow overlooked that detail, so for a while the mountain was simply known to them as Peak XV. Then one of the scientists had the peculiar idea of naming it for Sir George Everest, who had been Surveyor General of India several years before. He really didn’t have a whole lot to do with the mountain that bears his name, and to his credit, Sir George said at the time, “Really chaps, I’d rather you didn’t,” but the Royal Geographic Society officially adopted the name in 1865. Everest died the following year, just one of several historical figures who had their names given to mountains without good reason. Another is Mount McKinley, the highest peak in North America at 20,320 feet. The locals called it Denali — still do, in fact — but it got named for an obscure U.S. president, thanks to a gold prospector named William Dickey. The context was the election of 1896, in which a major issue was the American monetary system. McKinley was a proponent of the gold standard; Democratic candidate William Jennings Bryan favored silver. Dickey managed to get the New York Sun to publish an account of his Alaskan travels in January, 1897. In the article, Dickey made the preposterous claim, “We named our great peak Mount McKinley, after William McKinley of Ohio, who had been nominated for the presidency…” It was a political retort to the free-silver supporters with whom this gold panner had bickered, but the name caught on. A number of attempts have been made to get the U.S. Board on Geographic Names to change the mountain’s designation back to Denali. For over 30 years those efforts have been blocked by legislators from Ohio — William McKinley’s home state. That’s why a majestic mountain still bears the name of a president who is mainly remembered for the Spanish-American War, and for being suddenly succeeded in office by his vice president, Theodore Roosevelt. As you know, Roosevelt’s likeness is among those on Mount Rushmore, which was also not its real name. In the language of the Lakota Sioux, it had been called “Six Grandfathers” for its craggy peaks. American settlers subsequently gave it various names, including Cougar Mountain, Keystone Cliffs, and Slaughterhouse Mountain. That supposedly happened in 1885, but it leaves me wondering how a joking remark along the trail turned into a name that was officially adopted in 1930 by the U.S. Board on Geographic Names. The fact that in 1927, Charles E. Rushmore gave the largest individual donation to finance the carving of presidential sculptures on that mountain was probably just a coincidence, don’t you think? What possessed him? 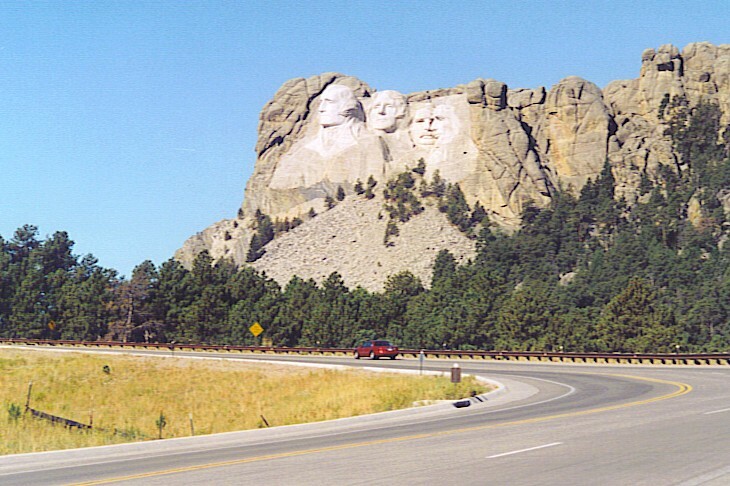 Why did sculptor Gutzon Borglum think it was a good idea to carve massive likenesses of four U.S. presidents into the side of a mountain in South Dakota? Part of the answer is that he was paid to do it; he already had some renown for grand-scale carving elsewhere. His project at Mount Rushmore may also have been inspired by his fascination with what Borglum’s wife described as “the emotional value of volume.” In other words, sculpted sixty-foot heads on a mountainside have a much greater “wow” factor than twelve-inch busts in a museum. Our hotel had promised a free continental breakfast, but they hadn’t specified which continent — it could only have been considered lavish in parts of Asia or Africa. There was an assortment of “pastries” that looked as if someone had sat on them. We picked through the meager selection and found a few items that looked edible, ate them, and got out of the tiny eating area as quickly as possible. By nine a.m. we were off to Mount Rushmore, which enabled us to get a prime parking place. There is a big parking structure, several stories high, just down the hill below the Memorial… The main walkway, leading past restrooms and a gift shop, continues through an arcade of flags of the fifty states and then terminates at what they call Grandview Terrace. The view is quite grand from there, and we took our first daytime photos of the presidents. For the record, they are (left to right) Washington, Jefferson, Theodore Roosevelt, and Lincoln. Incidentally, for the first time ever, the monument had just been given a thorough cleaning only last month. 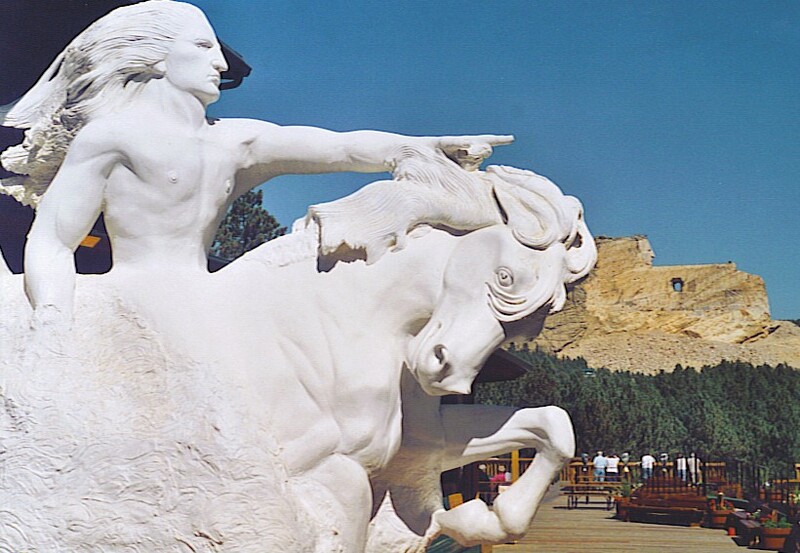 The self-styled “Storyteller in Stone”, sculptor Korczak Ziolkowski, had been approached by Lakota chief Henry Standing Bear — the official story goes — to commemorate their great hero. Korczak began work on the memorial in 1948 and died in 1982, but his wife and seven of his ten children are still involved with the project.